"It was quite the most incredible event that ever happened to me in my life. It was almost as incredible as if you had fired a 15-inch shell at a piece of tissue paper and it came back and hit you." If you wanted to know more about a dark room that you were unable to go into, you might be able to get an idea of its size and contents by throwing balls into the room and considering their behaviour (the sort of task you might get in an Adventure game made for the computer). you would be able to tell where obstacles were and roughly the size of the room. Physicists do the same kind of thing when 'lookling at' tiny objects such as atoms. In 1911 Rutherford wanted to find out more about the structure of the atom so he set two of his research students (Geiger and Marsden) the task of bombarding gold atoms with alpha particles, gathering data as to what happened to the 'missiles' and making deductions about the atom's structure from that data. In those days they did not have particle accelerators providing a ready supply of protons or neutrons so they had to use something that could be used as a natural probe - alpha particles were ideal. Alpha particles are small (only two protons and two neutrons) and yet have enough mass (4u) to be a suitable missile (lots of momentum!). They are produced naturally by radioactive nuclides that are alpha emitters (small proton rich nuclei) and so a steady supply was easy to obtain. Their properties had been under investigation for about a decade (much of it done by Rutherford!) and he had been doing research into the fact that if he used high energy alpha particles they were able to penetrate thin metal foil sheets when he came up with the idea of that they would be ideal as a probe to atomic structure. He was expecting tiny changes in trajectory as they met up with atomic substructure. Remember he thought of the 'atom' as the 'plum pudding' structure - he hadn't discovered the one you know about yet! The alpha source emits alpha particles randomly in all directions, but to study how their path is altered we have to be sure that they only hit the foil at a fixed angle (90O).To achieve this we must use a collimator. This absorbs all of the alpha particles except those travelling in one direction - unless they are travelling parallel to the sides of the outlet of the collimator they will impact on the side and be absorbed - so only those travelling parallel to each other and in one direction get through! A single atom is too small to look at. It would be impossible to get 'just one' to examine. Therefore Rutherford decided to look at a metal foil consisting of many atoms in a very thin sheet. If the foil was too thick the alpha particles would just be absorbed. Remember that he expected most of them to just go through but he knew that they could be absorbed by thicker foils and even by a few centimetres of air. It had to be performed in a vacuum because the air would absorb the alpha particles before they hit the foil or before they got to the screen! Zinc sulphide fluoresces (gives out a photon of visible light) when it is hit by a charged particle. Covering the microscope lens with ZnS allowed the viewer to 'see' where the alpha particles hit (or at least count their impacts). In order to find out how much the alpha particles had been deflected from their path the microscope arm was connected to a turntable. It could rotate around the vacuum filled drum and how far it had rotated could be read off a vernier scale etched onto the turntable. When the angle was zero (the straight through position) the number of scintillations per minute on the screen would be high. As the angle increased the number of scintillations per minute would be much lower. Less than 1 in 8,000 alpha particles backscattered. This gives an indication of the tedious work involved in taking a checking the results! They would have to be repeated many times to be sure they were not due to anomalies! Would you have been tempted to discount totally inexplicable results and give your professor a set of results he expected? Or would you, like Geiger and Marsden, repeat and repeat and report the strange findings to Rutherford so that a whole new model of the atom could be developed? It is the careful (and honest!) investigation into anomalies that often lead to new theories. Nowadays this could be done with data logging and computer analysis. In the early 1900s scientists had to do a lot of painstaking measurements! When Rutherford mathematically investigated the results he proposed a model that explained the results that Geiger and Marsden obtained. The fact that the vast majority of the alpha particles got straight through led Rutherford to propose that the atom was composed primarily of empty space. positively charged (because it repelled the alpha particles) nucleus in the centre of the atom (neutrons had not been discovered at that time - so he made no mention of them!). So his picture was one of the atom being like the solar system - the sun being the nucleus (taking a very small proportion of the volume of the solar system but being the vast bulk of the mass in it!) and the electrons being like the planets orbiting the 'sun'. This model was later amended by Bohr (to take into account a couple of points that Rutherford's atom did not fully explain - like the motion of the electrons and the orbital paths that could explain what the Chemists understood of electron behaviour in bonding) to make the model of the atom that you are taught at GCSE but it was still a magnificent advance to our understanding of atomic structure. The observations made in 1911 by Geiger and Masden carrying out the experiment for Rutherford were a fatal blow to the Plum Pudding model. J.J. Thomson had put forward this picture of what an atom was like in 1906 and it was accepted scientific theory in 1911. 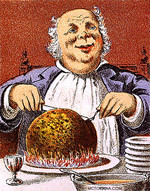 The central assumption of the Plum Pudding model was that the positive charge was uniformly distributed over the atomic volume - like the dough of a Christmas (plum) pudding. The electrons were embedded in it like the currants in the pudding mixture. For a helium nucleus to be deflected through 180 degrees as had been observed in this important experiment was only possible if the positive charge of the gold nucleus was concentrated in a tiny central area. The repulsion from such concentrated charge could explain why the positive helium nucleus was back scattered. Backscattering from the 'smeared out' charge couldn't do that! It took Rutherford a number of months before he finally decided that the only way his results made sense was if the charge was concentrated in a nucleus - he was the first to put forward such an idea... and let's face it, the idea seemed counter-intuitive - who would think the atom was mainly empty space? He had to be sure his calculations were correct before he put his idea forward to the scientific community. Once he presented his ideas and explained how he got the results that led to them scientists all over the world repeated his experiment to verify the results and checked his mathematics to see whether his theories were sound. We now know that Rutherford was right, but this was a revolutionary suggestion at the time and is a good example of how precise, repeatable experimentation can lead to us changing our thinking about how the Universe works - and lead to better understanding. If Geiger and Marsden had 'tinkered with' their results to make them do what 'made sense' and was expected we would have not made such a rapid advance in nuclear knowledge! Think of that the next time you are tempted to fabricate a repeat set of readings in class - or to get rid of an anomaly. The 1 in 8000 backscatter could have been seen as an anomaly, but Geiger and Marsden checked the 'anomalies' out - several times to verify they were nothing of the kind. If they had ignored them Rutherford would have been presented with a set of result that showed just what he expected to see... they would have been in accordance with current scientific thinking. Click on the icon - questions and answers at A level standard await you! 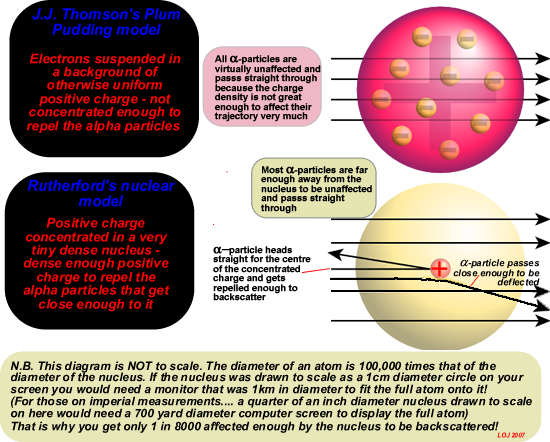 Click here to see how Rutherford scattering is used to estimate the size of the nucleus.